The Scottish painter David Roberts (1796-1864) set sail for Egypt on 31st August 1838, and travelled through to Nubia, the Sinai, the Holy Land, Jordan and Lebanon. He sketched drawings and paintings in situ, which were later reproduced lithographically by the Belgian-born Louis Haghe. Some 247 views and two maps make up the six volumes of this monumental work, which has been described as ‘one of the most important and elaborate ventures of nineteenth-century publishing.’ (Abbey, 1970). Roberts visited the pyramids at Giza, sailed up the Nile, sketched street scenes in Cairo, visited tombs and sites at Philae, Karnak, Luxor, and Dendra, and drew interior views of mosques. He was one of the few Europeans to do so. 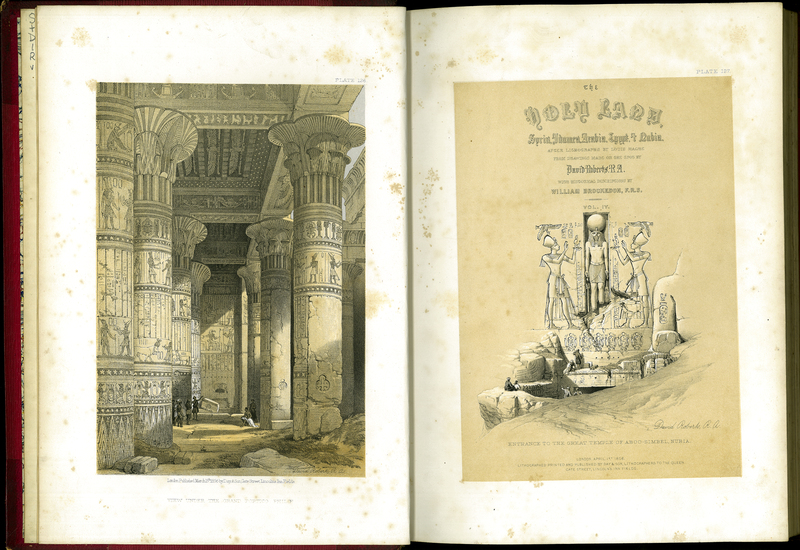 David Roberts, “The Holy Land, Syria, Idumea, Arabia, Egypt & Nubia,” ourheritage.ac.nz | OUR Heritage, accessed April 22, 2019, http://otago.ourheritage.ac.nz/items/show/10723.